Check out the electronic version of our brochure! Click brochure to see it! We have an amazing collection of shows from across the U.S.! And all sorts of genres! Comedy, Theatre, Music, Dance, Puppets, Performance Art, Visual Art, Circus and more! Everyone should be able to find something they like! We have over 100 performances of over 40 different shows up and down the artsy Penn Avenue area of Pittsburgh! Click here to see shows Alphabetically! Find more ways to search here! Get $3 off every show when you have a 2019 Fringe Button!! Plus you get to keep a cool memento of the 2019 Fringe! And they only cost $5! Two shows and you've more than made your money back! Show your Pittsburgh Fringe pride with a button! ABOUT THE ARTIST: Currently working and residing in Pittsburgh, PA, born and raised in Wisconsin, David is a cheese-eating, beer-drinking and overall working-class kind of artist. Primarily using found wood as painting surfaces, David creates work that focuses on storytelling, showcasing the themes of an individual raised on Saturday morning cartoons, inspired by the day to day and grounded in traditional painting and printmaking techniques. You'll see his "“Love & Language Barriers,” Acrylic on Found Wood on the cover of our printed brochure, our posters, our buttons, and our website. If you want to see more of his work, his work will be hanging in the LevelUp Studio, and he will be having an open house during our festival on Friday at 7pm to 9pm at LevelUp Studios. See more about the Mueller Art Opening! Help your local fringe by making a tax deductible donation today! We've added a new day for 2019! The festival will now be Thursday to Sunday, April 4-7th! Put it on your calendar! 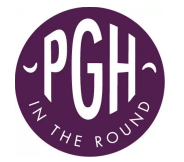 Read our preview by Pittsburgh in the Round! Push the logo to follow the link to the review! Want to see some old festival brochures? Below is our 2015 program! Below is our original program that you can download from 2014!